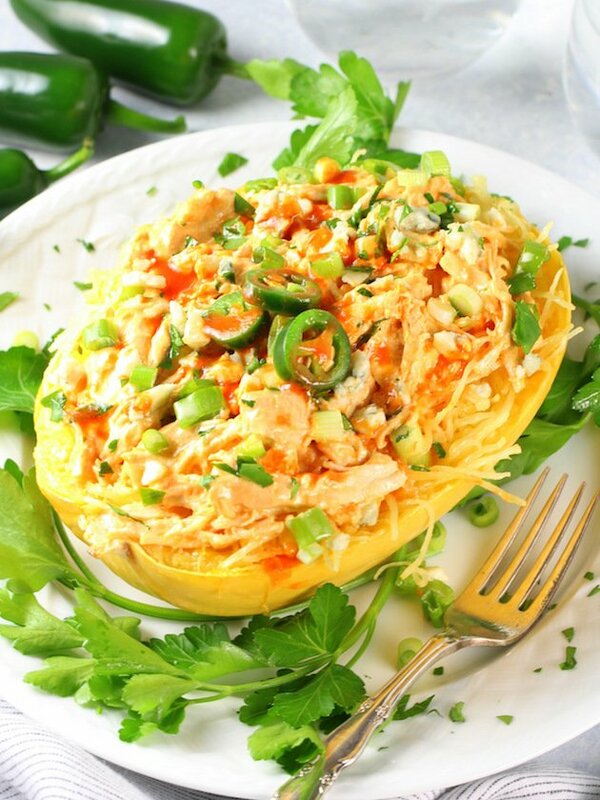 Get ready for one of the best spaghetti squash recipes, ever. Drop. The. Squash. This post may contain affiliate links… Read more here). So, I was recently chatting with my friends back in the Massachusetts/New Hampshire area. One mentioned they were having a white-out and the other said they were going on 6 months of winter with snow and ice scheduled for this morning! If you’re reading this, and this is your current situation, you have all my sympathy. For real. It hasn’t even been a year since we left New England, so I can still vividly remember how the cold gray days would wear on me. It really affects your mood, and then that really affects everything else in your life. The struggle is real people. I also remember when summer finally arrived, all I wanted to do was be outside – in the garden, at the beach, or on a picnic at a nearby winery. I would literally get anxious if it was a sunny day and I was stuck inside. I’m sure many of you reading this can relate. Amiright? I’m so grateful that my situation has changed for the sunnier. I must admit I’m absolutely loving spring in Florida! It’s just the perfect weather: 70-80’s, a nice breeze, and a few showers here and there to give me a break from watering my garden and the B man’s fruit trees! Can I just say I just love that we have fruit trees – an Orlando Tangelo and a Variegated Lemon tree. Buck and Buckaroo named after the very nice young man at the garden center that was saving them for himself but surrendered them in goodwill. Yes, his name is Buck and he proudly informed us that the official name on his birth certificate is Buckaroo. You can’t make this stuff up people!! Back to whatever really important topic (ahem) I was just discussing. Now come summer here in Florida, and I’m sure it will be a different story – 110 degrees with 100 percent humidity. Hot in herrrr my friend! It’s so interesting… there are always pros and cons to whatever location you live. It’s definitely important to remember the pros while in the midst of, say, an ice storm in April. Again, so sorry for all of you New Englanders! Whatever your weather situation, today’s recipe should make everything better. 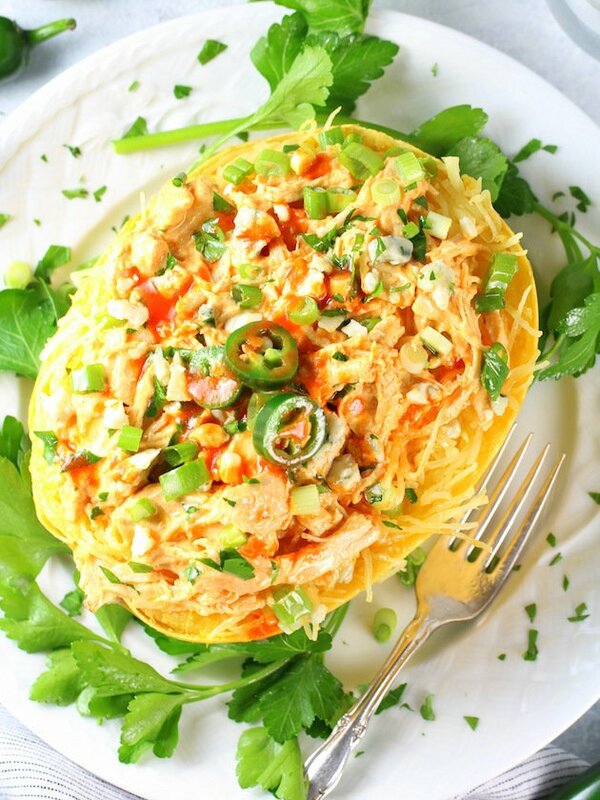 I’ve got an Instant Pot Spaghetti Squash Buffalo Chicken low-carb recipe that is super-delicious and will help you get that bod beach-ready! 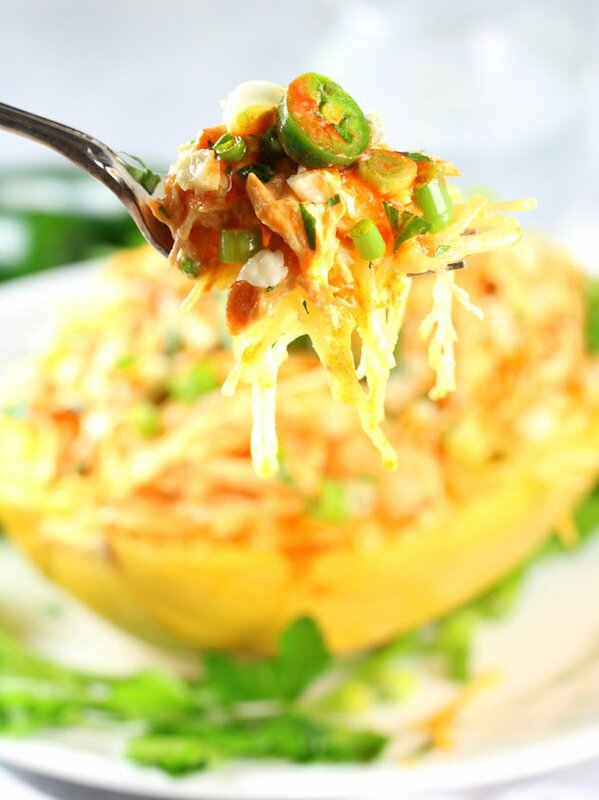 Don’t you just love Spaghetti Squash?? It totally looks all bright and sunny with its lovely golden hue. Plus, it’s such a great swap for pasta. 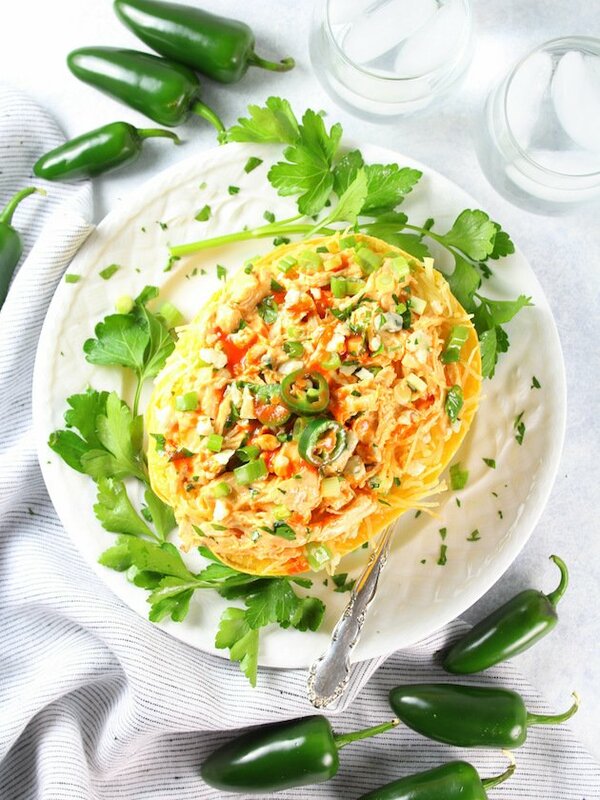 It has a mild flavor, soaks up sauce just like regular spaghetti noodles, and it’s low-carb, low-calorie, and full of nutrition. 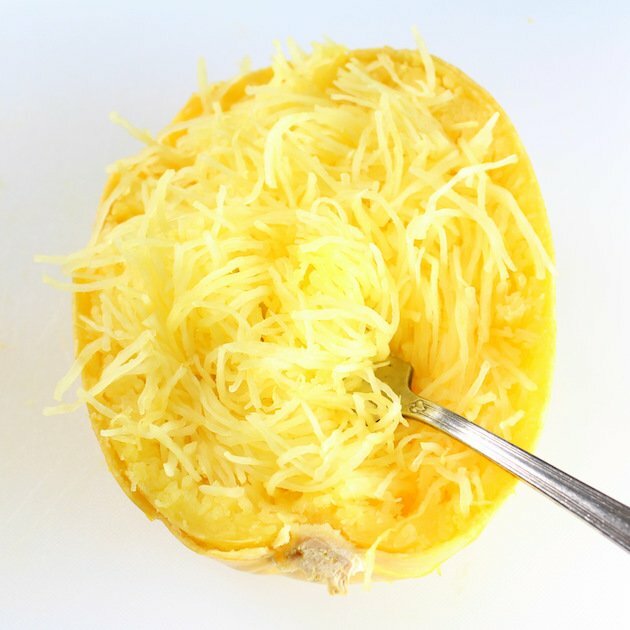 You’ll get small amounts of almost every essential vitamin from eating spaghetti squash, although the vitamins with the highest concentration found in this winter squash are Vitamin C and vitamin B-6. This sunny squash is super healthy! It contains only 42 calories and 10 grams of total carbohydrates per cup. Of those carbs, 4 grams come from natural sugar in the squash, and 2 grams come from dietary fiber. That makes it only 8 grams of net carbs per cup! Woohooo! 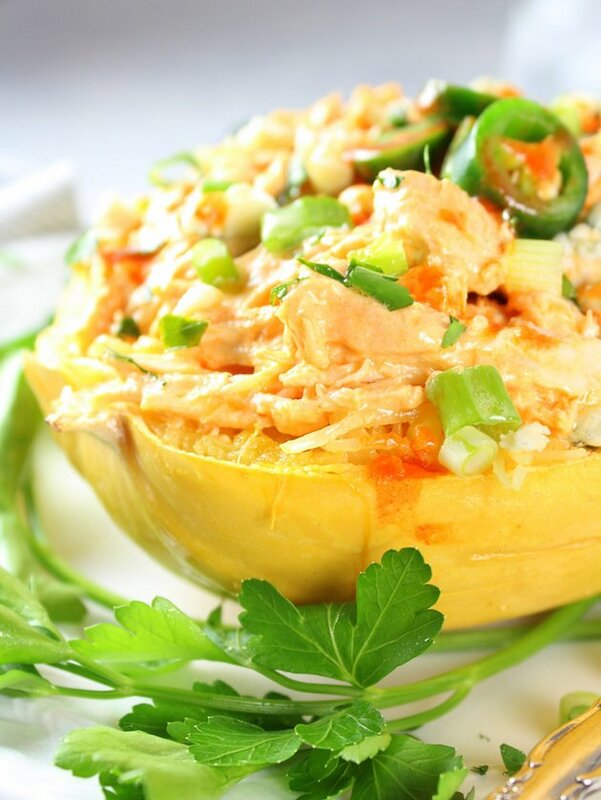 Choose spaghetti squash that is firm with no soft spots or blemishes. It should feel heavy for its size. 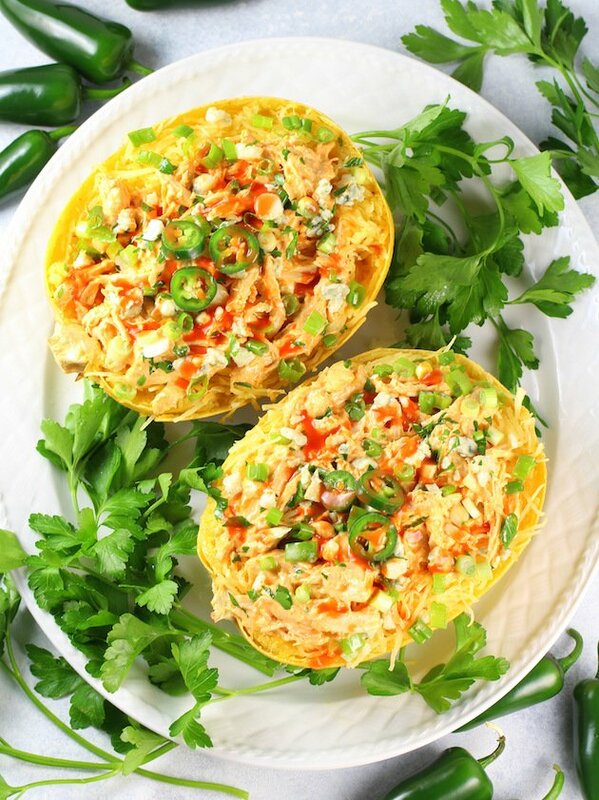 Store spaghetti squash in a cool, dry place. Wash the skin before cutting. 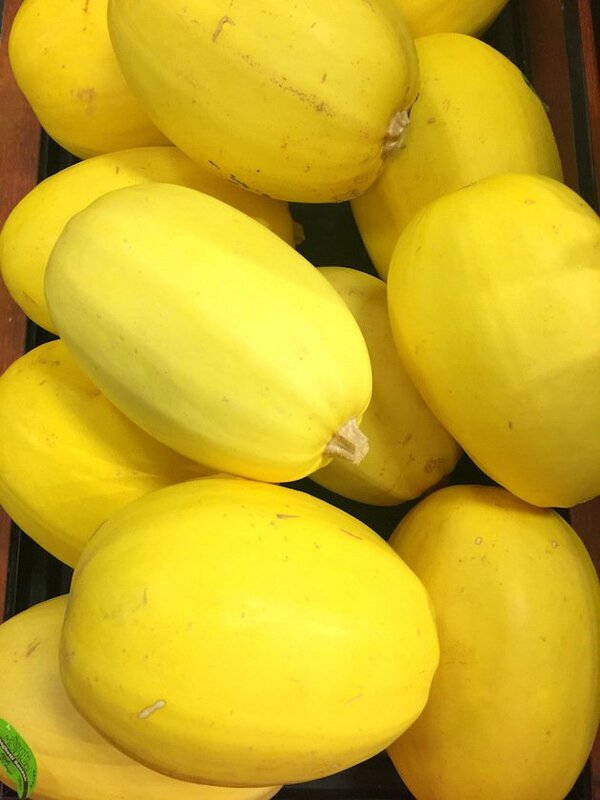 Once cooked, place spaghetti squash in the refrigerator in an airtight container to ensure freshness for up to a few days. 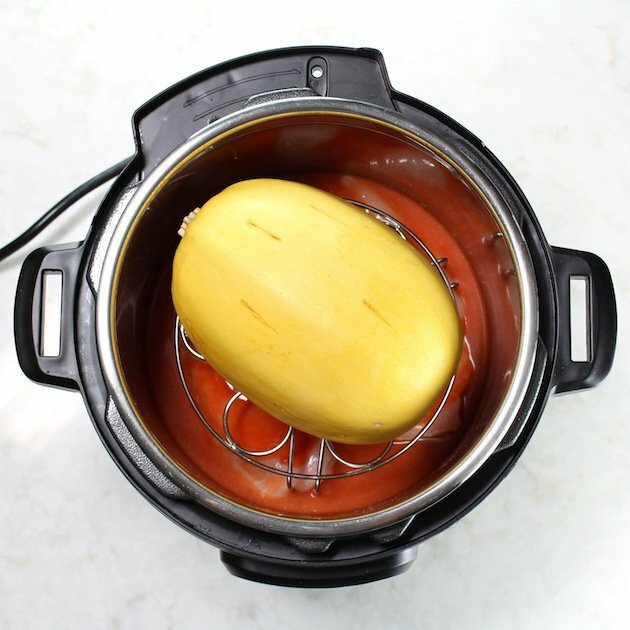 Steaming spaghetti squash whole in the Instant Pot will result in a very mild, neutral flavor. This may seem bland compared to roasting it cut in half, but you may find it to be a better blank canvas for your spaghetti squash recipes. 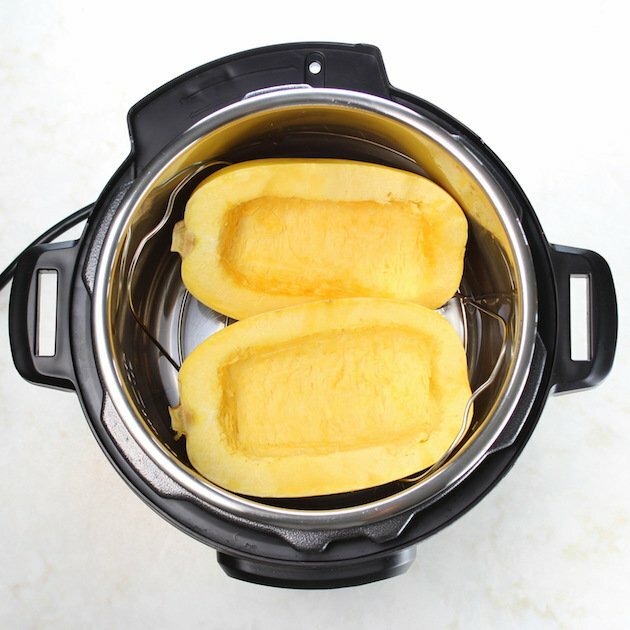 Although cutting the squash in half it takes a few more minutes to prep before pressure cooking it, this does reduce the cook time by about half. You simply cut the squash in half for shorter strands, or cut it in half lengthwise for longer spaghetti-like “noodles.” Then scoop out the seeds and sticky membrane around the seeds. Add 1 cup of water to the IP inner stainless steel pot and set the steam rack in the bottom. 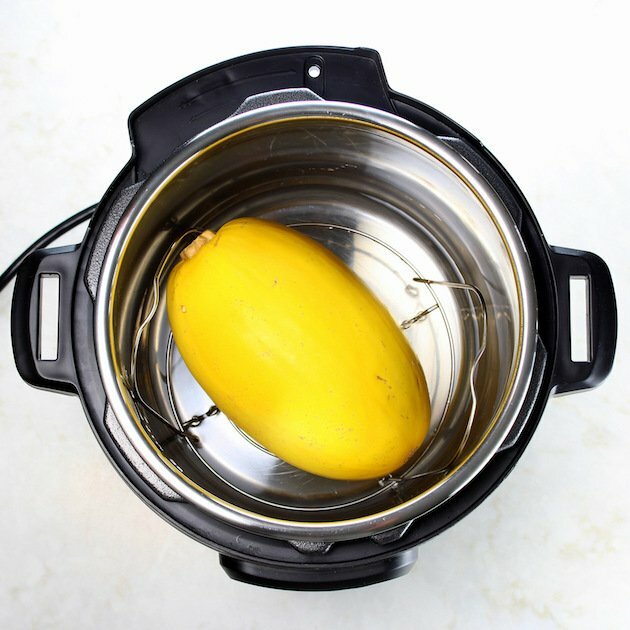 Add your squash, seal the IP and set it to pressure cook. For a 2.5 pound squash, 5 minutes of pressure cooking will yield “al-dente” firmness, and 7 minutes will yield a softer spaghetti squash. When the cook time is complete, manually move the pressure valve to “Venting” to release the steam when the time is up. Boom – low-carb spaghetti for your healthy eating pleasure. 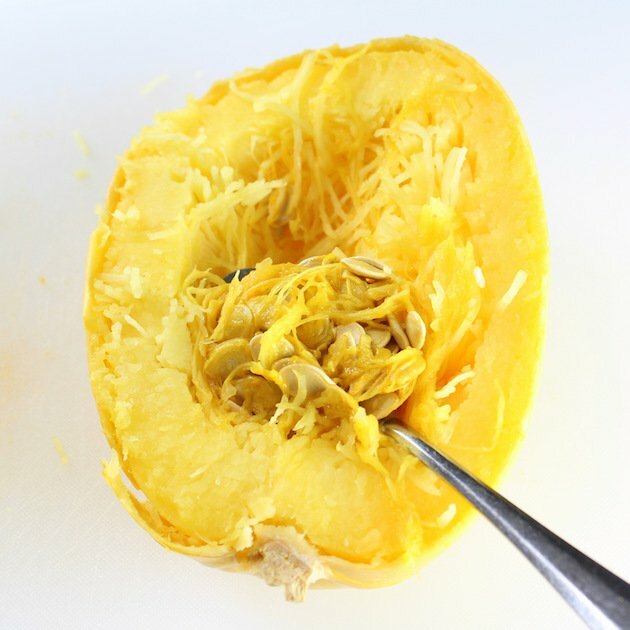 For the easiest method, you’ll want to know how to cook spaghetti squash whole. The main advantage here is – no prep whatsoever! If you’ve ever tried to cut a spaghetti squash in half, you know it can be slightly challenging. The hard skin is a bit difficult to cut through while slicing in a straight line. For the “cooking it whole” method you simply poke slits all around the squash (about 12-15) with a small paring knife. Be sure to get the knife all the way into the middle of the squash. Then it’s IP-ready. In hopes of getting dinner on the table quicker with the least amount of fuss, this is the method I’m proposing for today’s recipe. There is one small caveat… it all has to fit in the IP at once. To accomplish this, I used a small squash (about 2.5 lbs). But let’s get to the really important stuff, shall we!?? First, add 1 cup of chicken stock, ½ teaspoon garlic powder and ¼ cup of your favorite hot sauce to the inner stainless steel pot in the IP. Next, add 1-2 lbs of boneless, skinless chicken breast. Now, add another ¼ cup of hot sauce and press the chicken into the liquid. Wash and dry the outside of your squash and make 12-15 deep slits all over with a paring knife (be sure to get the knife all the way into the middle of the squash as this will help it cook properly). Place it on the wire rack in the IP. Now cover and seal the lid and set the pot to pressure cook (normal/high) for 16 minutes. When the time is up, manually move the pressure valve to “Venting” to release the steam. Carefully remove the lid, and the squash. Allow the squash to cool for 10 minutes. Meanwhile, remove the wire rack and the chicken breasts from the IP. Now, turn the IP to the Saute setting, and cook/reduce the sauce for 6-8 minutes. Then cut 8 ounces of cream cheese into 8 squares and add it to the liquid. 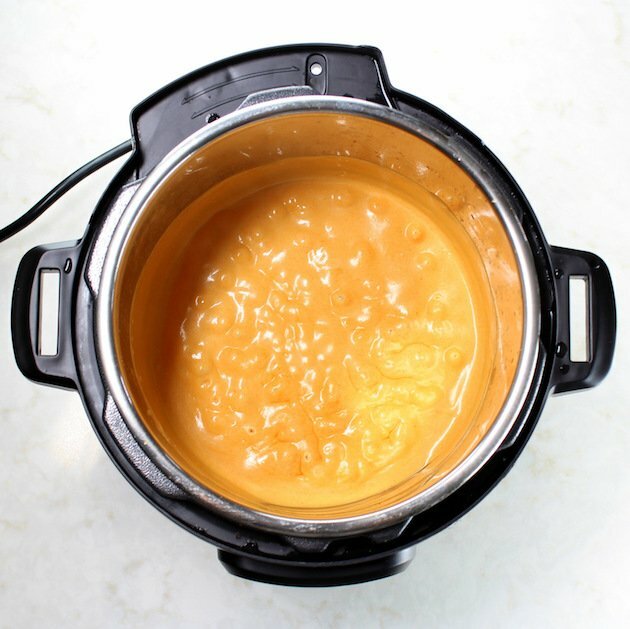 Stir or whisk the cheese into the sauce until it’s mixed in completely and becomes a creamy cheesy sauce. Mmmm! 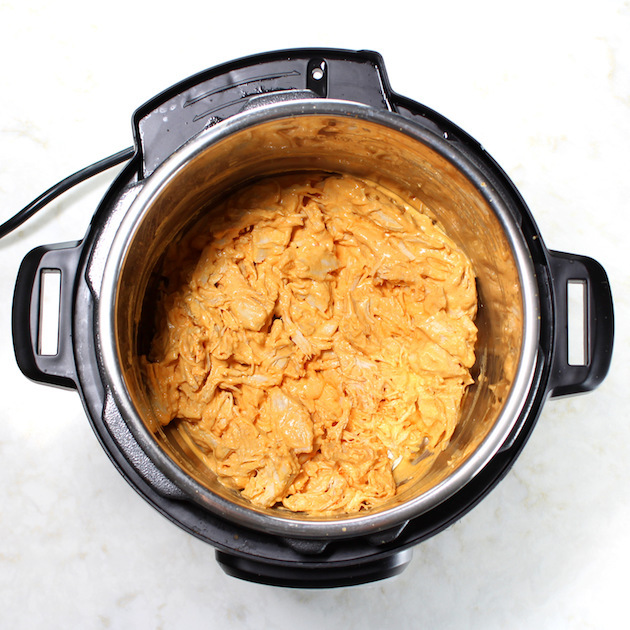 Now turn the pot off, shred your chicken, and fold it into the cheese mixture. 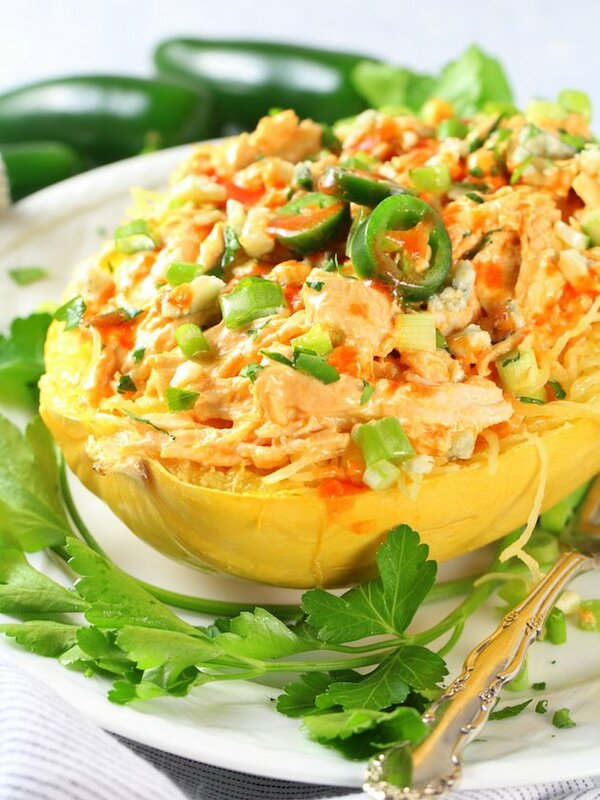 Top the squash with the cheesy Buffalo Chicken mixture and garnish with parsley, green onions, jalapeños, blue cheese or cheddar cheese, and more Buffalo sauce and devour! This is some good eating my friend! So creamy and cheesy and satisfying with a fraction of the carbs! That’s what I’m talkin’ about! 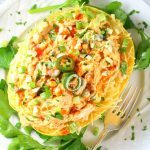 This Instant Pot Spaghetti Squash Buffalo Chicken is a delicious and nutritious meal you’ll be enjoying for many weeknight dinners to come. 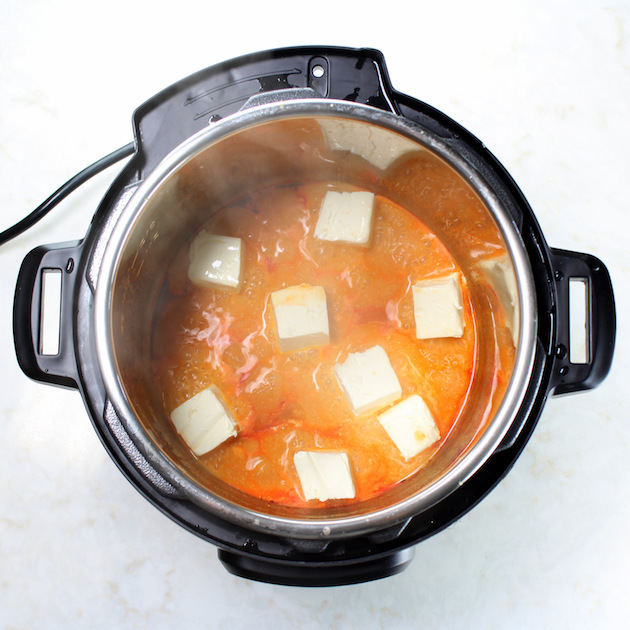 … and check out my latest Instant Pot Review here! A lightened up, mouthwatering recipe! It’s low-calorie, low-carb, full of nutrition, loaded with lean protein and it tastes insanely delicious! Garnish with chopped green onion, chopped jalapeño, crumbled blue cheese or shredded cheddar cheese and more hot sauce if desired. 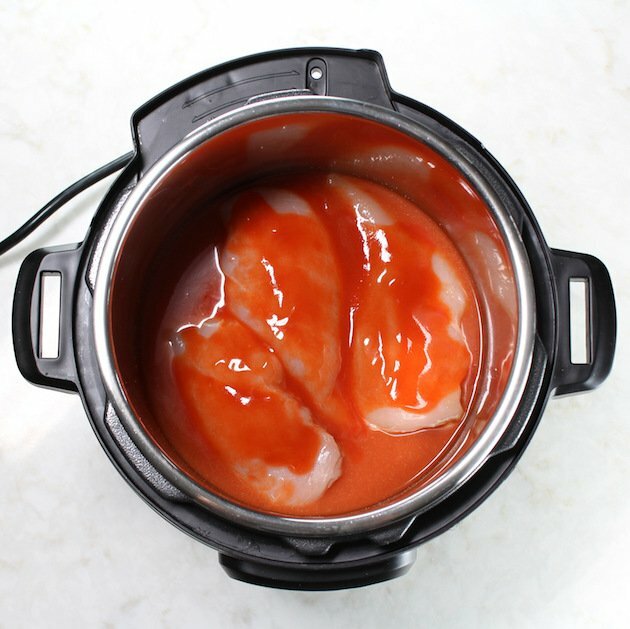 Add 1 cup of chicken stock, ½ teaspoon garlic powder, and ¼ cup of hot sauce to the stainless steel inner pot of the IP. Then add 1-2 lbs of boneless, skinless chicken breast. Add another ¼ cup of hot sauce and press the chicken into the liquid. Use a small paring knife to make 12-15 slits in the squash. Place a stainless steel wire rack or egg rack into the pot (the rack should be about 2 inches tall so it sits above the chicken, but be short enough to allow you to fit a whole squash in the pot). Then place squash on the rack in the IP. Cover and seal the lid, and set the pot to pressure cook (normal/high) for 16 minutes. 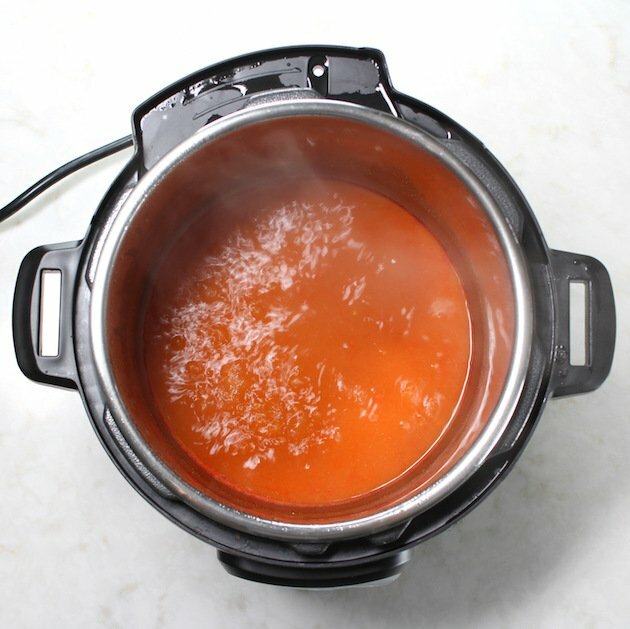 Once the Instant Pot is done cooking, release the steam by moving the top pressure valve to "Venting." 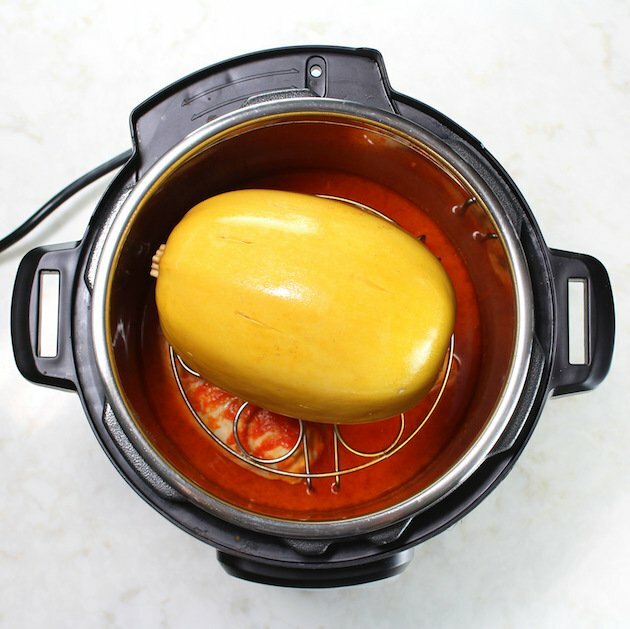 After steam has fully released, open the Instant Pot and remove squash with pot holders. Allow it to rest for 10 minutes. Meanwhile, remove chicken breasts and place them on a plate. 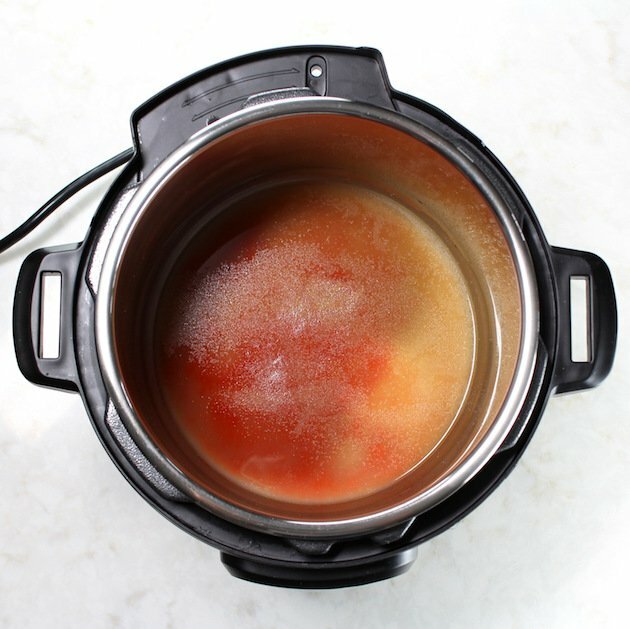 Leave the cooking liquid in the Instant Pot. Turn the Instant Pot setting to saute, and saute the liquid for 6-8 minutes. Add cream cheese and cook for 2-4 more minutes, or until the cream cheese is melted and has reached your desired creamy consistency. (If the cheese mixture gets too thick add a little more chicken stock.) 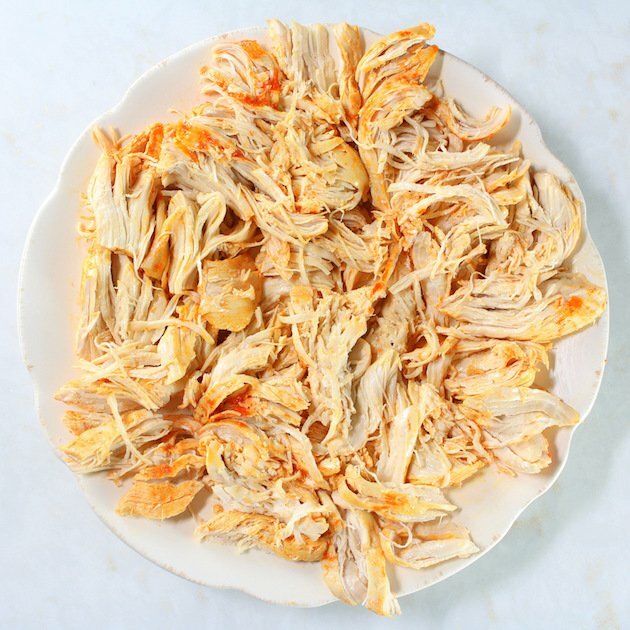 Use two forks to shred the chicken and add back to the Instant Pot. 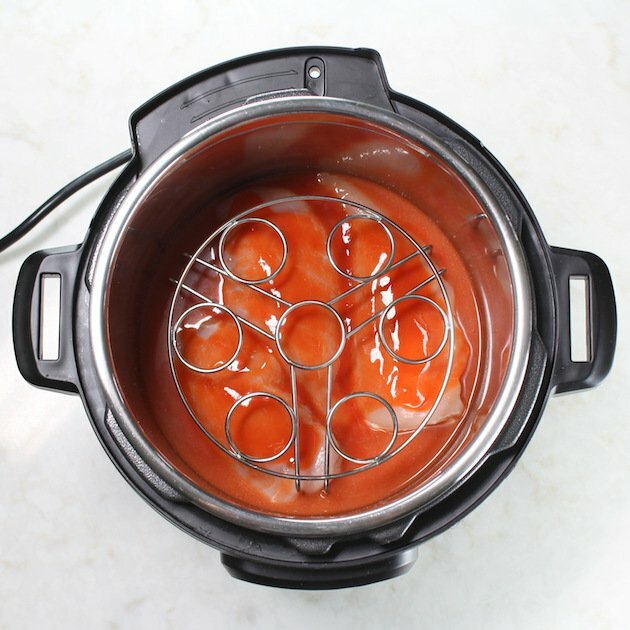 You may need to modify your simmering time, depending on how much cooking liquid is left after you remove the chicken from the Instant Pot. So keep a close eye on the consistency after you add the cream cheese, as you may need slightly more or less simmering to achieve the desired consistency! When the cooking was done I barely had any fluid left. A bit of the chicken was scorched. I had to make more sauce on the stove top! I have the Instant Pot 6 which only has normal and high pressure settings maybe the high is too much? Hi Cathy, so sorry to hear that. Did you turn the pot off completely after you whisked in the cream cheese? If not that could be the problem. I’m wondering if the saute setting was left on and the mixture continued to cook and the liquid evaporated. I mention in the recipe if the sauce seems too thick to add a little chicken stock. Next time you could add a little more if it looks like it’s getting too thick. Hi Terri, This recipe contains 6 servings total. So each 1/3 of spaghetti squash is a serving and 1/2 cup of the chicken and sauce is a serving. Hope that helps! Thanks so much, Patrice! I’m so glad you enjoyed it! In the text, the time required to cook the squash is 5-7 minutes depending on how you like it. It takes about 8-12 minutes to cook a chicken breast, depending on thickness. Yet the recipe says to cook the squash and chicken for 16 minutes. I’m not understanding why. Can you help me understand? Hi Leslie, I offer two ways to cook the squash in the text… cut in half for 5-7 minutes, or whole for 12-15 minutes. In the recipe I cook the squash whole (it was on the bigger side and I prefer it cooked more) so that is why the cook time is 16 minutes. The longer cook time on the chicken makes it even more tender and shreddable. I hope that helps. I’m confused. The ingredient list calls for 1/2 cup of stock but the instructions start of with 1 cup of stock. Please advise. THANKS! Hi Christine, the recipe should read 1 cup of stock – sorry about that! Hope you enjoy this recipe, it’s amazing!